Photos of models and celebrities always show completely flawless skin with no blemishes, marks, or sign of large pores. While these photos are certainly treated with photo editing software, the stars themselves tend to have healthier skin because they are the beneficiaries of treatments and products that maintain optimum skin health. If you have large pores on your skin, our HydraFacial MD® can minimize their appearance and restore smooth, youthful skin. Skin pores, which look like little holes in the skin, are simply hair follicles that contain oil-producing sebaceous glands. Everyone has pores on their skin, but some people’s pores are larger than others. Large pores have four main causes: genetics, age, gender, and oily skin. Large pores caused by genetics cannot be changed. If either or both of your parents have large pores, you may have them also. 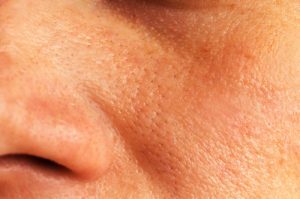 A genetic predisposition for large pores can also show itself later in life and may be exacerbated by aging. Aging can lead to enlarged pores because aging skin loses elasticity. Accumulated sun damage over time can change the way your skin cells group around the edges of your pores. Eventually, your skin will stretch out, which can cause your pores to appear bigger. In terms of gender, men tend to have larger pores than women. The properties of the skin vary significantly from males to females, and this is an example of one of the gender differences. Male skin also tends to be thicker and rougher. Oily skin tends to create larger pores. As oil, dirt, and debris collect on the skin, the skin swells, causing the pores to enlarge. Makeup can contribute to the appearance of enlarged pores because it can act as a magnet for debris or excess oil. There are several ways to treat enlarged pores. First, you should cleanse your skin thoroughly each night with a gentle cleanser. Toners, exfoliators, and masks can also help keep the skin tight. Moisturizers are essential for protecting the skin from outside debris and oil. Finally, there is the HydraFacial MD®: a 30-minute in-office treatment that produces immediately visible results. The HydraFacial MD® is safe for every skin type and gently improves overall skin tone. Your skin will be deep cleaned, evenly exfoliated, removed of all impurities, and infused with important skin nutrients to boost skin health. The treatment has no discomfort or downtime, and it is one of the most effective non-invasive skin rejuvenation services we offer here at Southwest Plastic Surgery. You can minimize your enlarged pores and achieve more youthful skin with a relaxing and thorough HydraFacial MD® treatment. At Southwest Plastic Surgery, we offer the HydraFacial MD® and other skin treatments to rejuvenate your appearance and infuse your skin with essential and healthy nutrients. To request your appointment, call (915) 590-7900 or complete our online contact form today.